I served as a research scientist and ethnographer on the National Institutes of Health funded project, “Corazón por la Vida: Comparative Effectiveness Research for Eliminating Disparities,” a large interdisciplinary study which examined the cost effectiveness of a promotora (community health worker) led hypertension management program for Latinos in rural New Mexico (National Institutes of Health, National Center on Minority Health and Health Disparities, Grant #3P20MD004996-01S1). I also assisted with a sub-award partnership between the Prevention Institute, Hidalgo Medical Services, and the Hidalgo County Health Consortium which examined upstream health policy issues in Hidalgo County, NM. Sean Bruna (PI), Malora Christensen, MSW, LSWAIC, Catholic Community Services, Associate Director of Housing-Whatcom & Skagit (Community Co-I), Peter Miterko, MA, Megan Stephenson, MA. Catholic Community Services is interested in expanding project-based permanent supportive housing (PSH) in Bellingham, WA, a small city in a rural county. PSH has been utilized as a means for managing homelessness in major cities nationwide, however, program effectiveness is not yet understood in our community. This community based project seeks to influence and strengthen local understandings and policies regarding PSH by examining (mis)perceptions the community has about housing the homeless. Part 1: Sean Bruna (PI). “Is Ethnographic Evidence Public or Private? Opportunities and Challenges to Contemporary Data Sharing Requirements with American Indian Tribes,” in Organize This! Data Management for Anthropology. Jerome Crowder and Richard Freeman, eds. (Accepted, Under Editorial Review for 2019). Palgrave Publishers. I examine that data sharing, new as it is to cultural anthropology, and argue that it presents an opportunity to decolonize the discipline’s ongoing trend of knowledge extraction by challenging our notions of control, ownership and management of ethnographic data. This chapter discusses the vague data sharing requirements I developed with a partnering tribe, disentangles specific ethical and infrastructural challenges to meeting the requirements, and presents recommendations for future ethnographic data sharing with tribal communities. Part 2: As a second portion of this research, I am partnering with Ysleta del Sur Pueblo, TX, a tribe in west Texas to develop a living tribal archive and repository for research data. Though details are under embargo, we are examining the possibility of developing an archive where (1) historical and contemporary content may be actively engaged by community participants given various community-designated restrictions and (2) a repository for data collected by researchers that are (a) hired by the tribe, (b) partner with the tribe, or are (c) internal tribal researchers. This project is in consultation. Led by Sean Bruna (PI), in collaboration with Heather Fullerton (College of Charleston), and Emilio Bruna (University of Florida). In 1990 the American Anthropological Association published “Surviving Fieldwork: a report of the Advisory Panel on Health and Safety on Fieldwork, American Anthropological Association.” The risks addressed in this survey covered a variety of topics, some of which include death, assault, tapeworms, and disease. This research updates and enhances the original survey to address global fieldsites, adds qualitative components, disentangles how academic level, gender and ethnicity impact risk/safety practices, and examines the content and quality of related institutional material/training. Currently (1) identifying trends in the literature and (2) drafting large grant for submission. Support from 2017 NSF Summer Course on Grant Writing at the University of Florida & 2018 WWU Project Development Award ($10,180.20). Led by Sean Bruna (PI) and in collaboration with Heather Fullerton, Giselle Kiraly, Emilio Bruna. As part of the Gatekeeper Project, this research examines the changing gender of editorial boards and staff of ten leading anthropology journals over the last 40 years. We completed the pilot project, are in the final stages of manuscript preparation, and are now preparing a large grant to examine all American Anthropology Association Editorial Boards in greater detail. Nayantara Sheoran (PI) (Postdoctoral Fellow, The Graduate Institute, Geneva), and Sean Bruna. This mixed methods research examines gendered leadership within the Society for Medical Anthropology. Teaching Medical Anthropology: Analysis of Medical Anthropology Syllabi in the U.S.
Sean Bruna (PI) with Tyler Stodola (WWU BA, 2017), the aim of this study is to understand the topics and content taught in U.S. medical anthropology courses, and to consider if courses address MCAT exam related content. Sean Bruna (PI). While undergraduate mentoring programs are now commonplace on university campuses, research regarding mentorship programs has not kept pace (Crisp & Cruz, 2009; Gershenfeld, 2014). Among undergraduate mentoring programs nationally, there is a general assumption that individuals in the social sciences are more adept at discussing diversity issues, and that underrepresented faculty are highly sought out by underrepresented students in need of mentoring. However, without research into the issue, this practice is generally not understood, or worse, misunderstood. As such, this research seeks to understand which WWU faculty and staff are sought-out by underrepresented students for informal mentoring and why they choose certain faculty over others. Sean Bruna, PhD and Emilio Bruna, PhD. (University of Florida). In this project, students research and test mobile applications for field research and are developing a website/catalog of the applications (draft site). This community-based participatory research study with the City of Edmonds assess the walkability within a region adjacent to downtown, while also examining local walking practices and perceptions of the place. Funding has been approved and we are currently in the research development stage with plans to conduct research in Spring 2017. Led by Brooke Jerspersen (WWU Graduate currently a PhD. Student at Case Western Reserve University): Cultural competence is a multi-level strategy for ensuring culturally and linguistically appropriate medical care and reducing health disparities. Little is known, however, about how it is enacted across diverse health care settings. The purpose of this project was to evaluate cultural competence training programs currently utilized by health care institutions in the United States and provide recommendations for a local health center. The revised Tool for Assessing Cultural Competence Training (AAMC, n.d.; Lie et al., 2008) was used to evaluate two cultural competence curricula designed to train primary care providers: the first is an online course developed by the Office of Minority Health and the U.S. Department of Health and Human Services called “A Physician’s Practical Guide to Culturally Competent Care” (Think Cultural Health, n.d.); the second is an online presentation by Mount Rainier Health System entitled “Generational and Cultural Competency”. 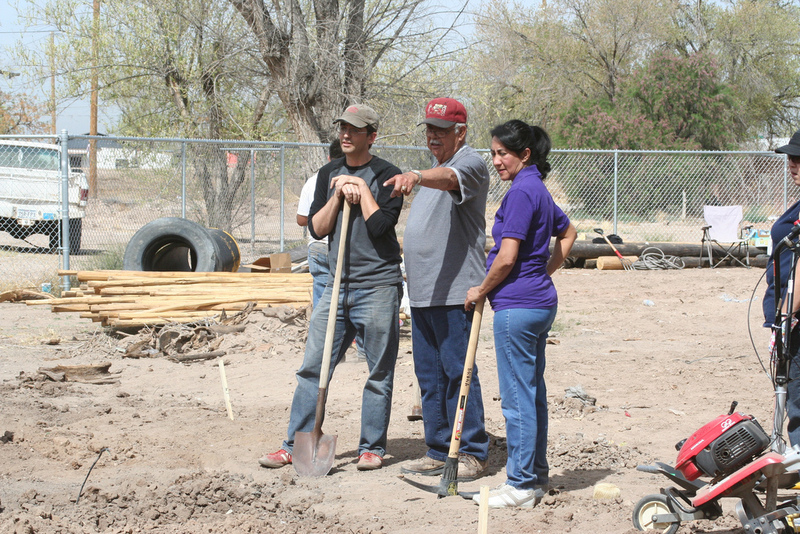 Discussing the community garden at Ysleta del Sur Pueblo. From Left: Sean Bruna, Cuco, and Deloris. This dissertation research, funded by the CDC, Robert Wood Johnson Foundation and Mellon Foundation, was a community- based participatory research study of type II diabetes prevention practices at a Federally Recognized Tribe. In dialogue with both public health and anthropology, the study critiques translational health theories and examines a community health center and the broader tribal community it serves. Topics explored include a detailed political economic history and the impact on present day diabetes prevention efforts, structural challenges hindering individual oriented biomedical prevention practices in a health center, communal “emergent” religious/spiritual prevention practices, and generationally defined wellness trends. 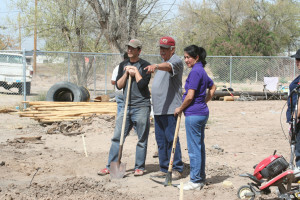 Funded by the Alfonso Ortiz Center for Intercultural Studies at the University of New Mexico, this CBPR project is in partnership with the Ysleta del Sur Pueblo Youth After-School Program and the Community Health Center. In this project youth learn photography skills, explore and express their identity through photography, and host an art opening. Selected photos will be professionally printed and framed for display in the Community Health Center. This paper is White Paper for the U.S. – Mexico Border Health Association. I provided research and writing assistance. Abstract: This thesis examines one example of the growing trend in which U.S. states challenge the sovereign power and rights of federally recognized tribes. Threats to tribal sovereignty have taken place throughout Indian country officially since the 1950s “Termination Era” politics and there is a growing concern that tribes must again prepare for a new period of renewed threats. This research considers this trend by examining the path of Tigua federal recognition and the various ways ethnic and legal identity each play a part in the formation of Indian identity. I propose that the interactions between the U.S. legal system and the Tigua have resulted in the formation of two different notions of Tigua identity.